Up until the week of Christmas, citizens of Colorado may have thought that snow removal wasn’t going to be necessary for the remainder of 2014. But Mother Nature had other plans and with the current cold snap, this snow will hang around for a bit longer. 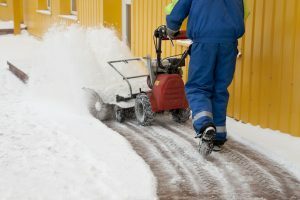 If you’ve cleared just enough snow around your apartment complex or business to make it accessible, but still need more moved, call Advanced Landscaping and Sprinklers for snow removal services in CO.
We specialize in heavy snow removal and have the equipment to move large amounts of snow in a short amount of time. If you’re the building manager for an apartment complex or church, we can help clear your parking lot or entrance, making it easier for residents and attendees to access the building. We utilize plows and skid-loaders to push the snow away from the heavy traffic areas, giving drivers and pedestrians plenty of room to maneuver. If you’re in charge of the neighborhood homeowner association (HOA), we’ll work with you on contracting our services for the long-term, giving you peace of mind that the snow will be cleared every time it falls. While the snow may be beautiful, especially as it sits on the peaks of the Rocky Mountains, it can be irritating when it’s blocking your driveway or store entrance. Contact Advanced Landscaping and Sprinklers today for your snow removal services in CO and we’ll be there to scoop you out every time. You can reach us at 970-305-3206 or feel free to contact us online.